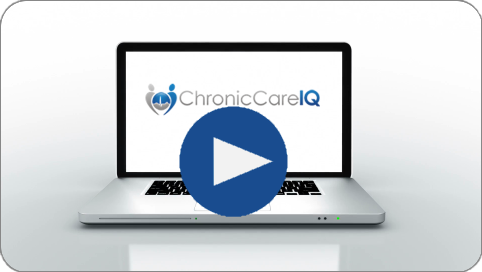 This guide will show you how to update your health status using ChronicCareIQ. 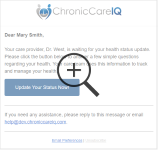 When you set up your ChronicCareIQ account, you will also be signed up for automatic reminder emails. 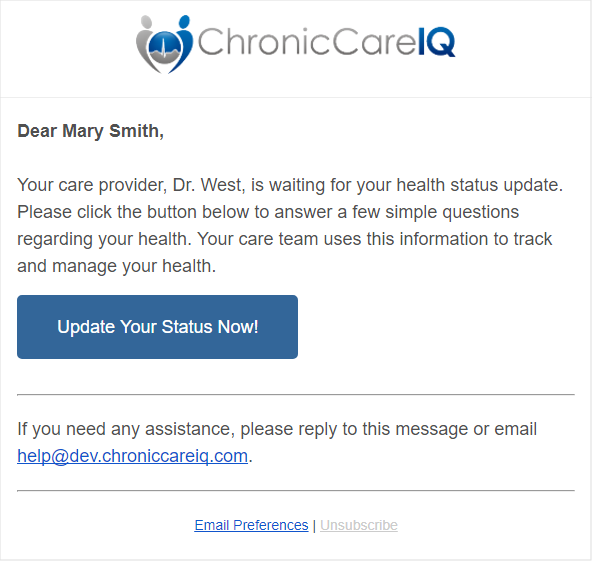 These reminder emails will let you know when it’s time to provide a new health status update, and also provide a link to easily access your questions. To access your questions, simply click the “Update Your Status Now!” button in the email. Once you’re logged in, your most recent health status questions will automatically be displayed. Once your questions are displayed, the next step is to answer them and submit your responses to your care team. Simply answer each question and press the Finished button to submit your responses. Once you’ve submitted your answers, you will see a confirmation message to let you know that your care team has received your update. In some cases, your physician may give you the opportunity to provide additional answers outside of your regular health status updates. To access these questions, use the “Add additional answers” link displayed on the confirmation screen. You can view a history of your previous answers, by using the “View answer history” link on the confirmation screen. See the Features and Navigation guide for more details.